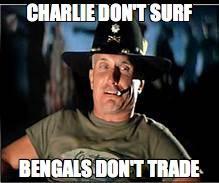 Tannehill - THE BENGALS FORUM - For Bengals Fans *Only* - Go-Bengals.com - The Best Bengals Fan Community in the World! Friend from old job, Dolphins maniac, sent me this. I reply yeah we'll trade ya Dalton for Tannehill and a 2nd. He replied back I hate Dalton Tannehill is much better. I reply I'd take Driskel over both of um. Driskel is horrible, he can barely hit the broadside of a aircraft carrier.....he has no clue where the ball is going when it leaves his hand. I think this is a photo of their conversation about the three QB's. We got Dead Eye Driskel. We don’t need anything else. Tannehill is better than Dalton. If he ever had an O line and AJ as his #1 receiver he would be quite a bit better. Doesn’t mean he is great. Has Meow left the building? Naw I'll admit Driskel sucked it up. But I don't like tannehill at all. I'd rather roll with Dalton this season than tannehill. He is better IMHO but not so much that we would give much up to get him. If we were to make this kind of move now would be the time to do it. Both are high risks to rely on for a full season. I'd like too see some younger whipper snappers get a shot and keep Dalton over trading anything more than a 3rd for tannehil. I think it's safe to say MB ain't trading chit for now. Dolphin fans your stuck with tannehill. Too many good QBs out there and more coming in. 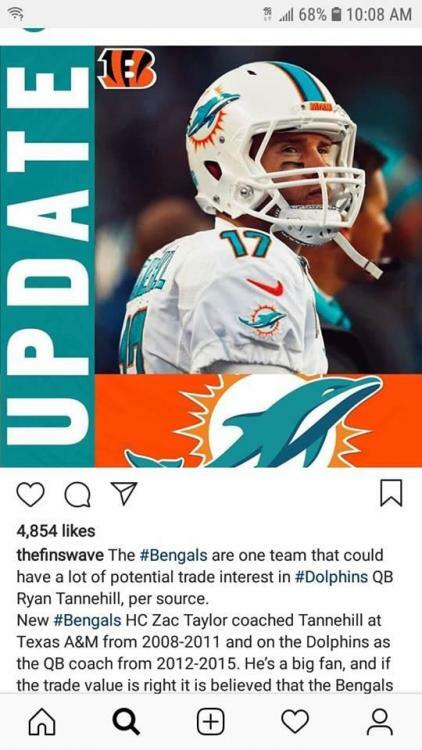 Even if Tannehill is a tick better theoretically (he certainly hasn't demonstrated it) the difference is too marginal to give up anything in a trade. If we want a significant upgrade at QB it's going to be a draft pick, and it would be foolish to invest heavily in QB with this scrub OL to protect them. No reason to throw a promising rookie to the wolves like that. Even if Tannehill﻿ is a tick better theoretically (he certainly hasn't demonstrated it) the difference is too marginal to give up anything in a trade. And he hasn't played a full season since 2015. Oh well in that case we should sign him up! We love guys that haven't been productive since 2015. Eifert will be happy! They can chill on IR together. Frankenstein together pieces of him, Tannehill, Glenn, Burfict.. We'd have a great football player. If his eye is indeed dead it could explain his accuracy issues (poor depth perception). Driskel didn't have a full complement of weaponry (Green, etc) at his disposal, and I think that coupled with super conservative playcalls and probably his own nerves sunk him. I think he's better than he's shown.